New York, N.Y. : DK Pub., 1997. 383 p. : col. ill., col. maps ; 29 cm. Bible. English. New International. Selections. 1997. The illustrated family Bible : based on the New International Version Bible / consulting editor, Claude-Bernard Costecalde ; illustrator, Peter Dennis. 130 ME:UniformTitle 0 $a Unform title Bible. $f Date of a work 1997. $c Statement of responsibility consulting editor, Claude-Bernard Costecalde ; illustrator, Peter Dennis. 246 VaryingTitle 14 $a Title proper/short title DK illustrated family Bible. 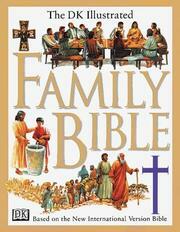 650 Subj:Topic 0 $a Topical term Bible stories, English. 700 AE:PersName 1 $a Personal name Costecalde, Claude-Bernard.